Back pain can be caused by a single significant injury or trauma, or it may be the result of an ongoing repetative stress on the muscles, tendons, joints, discs. Below is an overview of some common reasons someone might be experiencing back pain. 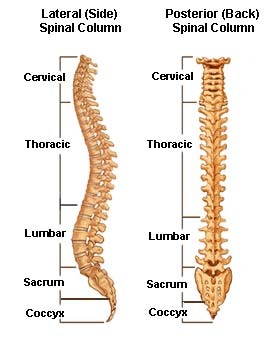 Like any bone in the body, the 33 vertebrae of the spinal column can break. The medical term for a collapsed vertebra is a compression fracture. A physician will first need to determine the cause of a compression fracture before treatment. Compression fractures that can result from cancers, malignancies, advanced osteoporosis, or other severe conditions are called pathological fractures. Traumatic events like a fall or a car accident can also cause compression fractures. Sprains and strains can occur all over the body, including the back. For patients that complain of back pain, sprains or strains are the most common cause. A sprain refers to a ligamental injury, while a strain is an injury to a muscle or tendon. Overuse, trauma, poor body mechanics, or a lack of conditioning can result in a sprain or strain. 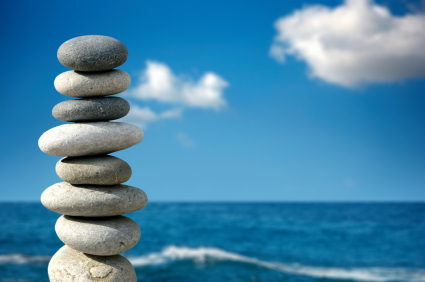 Treatment programs typically prescribe a period of rest followed by a period of therapeutic exercises to increase flexibility and strength in the affected area. Dislocations, the medical term for when two bones that normally work together have become misaligned at the joint, can occur in the spinal column. Aside from causing pain, dislocations can destabilize the spine and make the spinal cord vulnerable to injury. The cartilaginous disc in between each vertebra that serve as the spine's shock absorbers are made of tough fibrous tissues called annulus fibrosis and have a gelatinous substance called the nucleus pulposus in the center. The deterioration of these discs is called Degenerative Disc Disease (DDD). In DDD, the discs no longer contain the normal amount of gelatinous fluid, and the protein-based structure of the annulus fibrosis has weakened. Basically, the discs can no longer absorb stress as well as they used to. DDD, which occurs gradually, is a fairly common result of aging. A traumatic accident to the back can also cause DDD. Surgery can be used to treat this condition, but normally other, less intensive treatments are used to relieve DDD-related pain. In healthy discs , the fibrous tissues of the annulus fibrosis fully enclose the gelatinous nucleus pulposus. In a herniated disc, however, the nucleus has protruded through its encasement to put pressure on nerves. The result may be pain, tingling, numbness, or weakness. If the herniation is in the upper (cervical) region of the spine, symptoms might be experienced in the arms or hands. Lower spinal herniations can affect the legs and feet. The risk of herniation starts to increase after age 30. Informally known as the "fragile bone disease" and most common in post-menopausal women, osteoporosis is the condition in which bones lose their density because of a deficiency in certain minerals and vitamins like calcium. This loss of bone mineral density causes bones to be weaker and increases the risk of fracture from daily activities. In the back, osteoporosis can result in compression fractures (see above). Osteoarthritis is a condition in which the cartilage that serves as a cushion and lubricant between joints is worn down. Also known as degenerative joint disease (DJD), this most common form of arthritis can cause stiffness, pain, and cracking noises at the joints and carries an increased risk of injury. Severe cases can result in bone damage. Osteoarthritis can occur in spinal joints and is also common in fingers, knees, and hips. The medical term for a "slipped disc," spondylolisthesis is the condition in which a vertebra has slid forward, or translated, and is no longer in line with adjacent vertebrae. Spondylolisthesis compromises spinal stability and can put pressure on the spinal cord and nerves, possibly resulting in symptoms of pain, numbness, tingling, burning, or weakness. Many factors can cause spondylolisthesis, including facet joint degeneration, disc degeneration, trauma, or a defect in the vertebrae. Surgery is sometimes necessary to treat severe cases of spondylolisthesis. Facet joints link vertebrae to each other and are instrumental for movement of the spine. When these joints are over-stressed, the result can be stretched ligaments, worn-down cartilage between joints, and friction. The pain the results from facet syndrome is most commonly felt at the spine itself in the neck or lumbar regions. Sometimes, the effects may extend to limbs or other parts of the body. Nerves extending from the spinal cord to other parts of the body pass through intervertebral foramen, the medical term for specialized passages in the vertebrae. An injury, aging- or disease-related change, or a birth defect can render these passages too narrow. This condition, called foraminal stenosis, pinches the nerves and can cause sensations of numbness, tingling, or burning in limbs or other parts of the body. Untreated or severe cases of foraminal stenosis can cause a loss of function. If the channel that allows the spinal cord to pass through the vertebrae is too narrow, the condition is called spinal stenosis. Spinal stenosis, which can be caused by injury or aging- or disease-related change, will press on the spinal cord and can result in weakness, numbness, tingling, or burning sensations. Loss of function or disability can result from extreme cases. The risk of spinal stenosis starts to increase after age 50. Not strictly associated with the spine, the disorder named fibromyalgia causes pain and tenderness in soft tissues as well as general fatigue. In some cases, the pain of this condition can be persistent and debilitating. The soft tissues affected by fibromyalgia are in up to 18 specific points around the body, and the exertion of gentle pressure on these points can help a physician to diagnose the condition. Unfortunately, medical researchers have not yet definitively determined the cause of fibromyalgia.